Come take a trek of discovery along Georgia's Southern Rivers Birding Trail. The trail winds its way from the rolling hills of the Georgia Piedmont on the north southward across the broad expanse of the Coastal Plain before curling eastward and eventually terminating in the Okefenokee Swamp, the Land of Trembling Earth. The 30 sites along the trail have been carefully selected to provide the wildlife watcher with a broad spectrum of wildlife viewing experiences. If you take the time to visit all of these sites, you will have the opportunity to visit some of the region's most beautiful and diverse natural communities as well as some altered by the hand of man. Many of the sites are located along two of the state's great rivers the Chattahoochee and Flint. For untold generations, these rivers have provided the life blood to the region. They have served as arteries of commerce and travel as well as providing the region with abundant reliable sources of water. Today, they also offer the outdoor enthusiast a wealth of recreational opportunities such as boating, fishing, hunting and bird watching. Yet they are only part of the picture. Along this rural byway you can travel back in time and bird on the grounds of an elegant southern plantation devoted to the sporting life, walk through a longleaf pine/wiregrass community patrolled by gopher tortoises, hear the roar of the alligator in the mysterious Okefenokee Swamp, watch birds through what is arguably the world's most famous birding window, trek into one of the state's largest remaining Carolina bays and watch hundreds of wading birds returning to roost for the night; birdwatch from a golf cart, search for warblers and thrushes among one of the world's largest collections of azaleas, and try to locate tiny songsters flitting in the tops of centuries-old cypress trees. Along the way you can see the rarest of the rare, the red-cockaded woodpecker; wild turkeys, wading birds such as wood storks, ring-necked ducks and other waterfowl, hear the Bob-white call of the northern bobwhite, see blue grosbeaks and indigo buntings looking much like brightly colored ornaments hung on shrubs growing in field borders, as well as Mississippi kites, ospreys and bald eagles exhibit their mastery of the air. All told, 263 species of birds have been identified at sites along the trail. The kaleidoscope of birds, butterflies, wild flowers and other denizens of these unique sites cannot be fully enjoyed in but one visit. Armed with this roadmap to adventure you will want to return again and again to explore what has been until now one of Georgia's best-kept natural secrets. 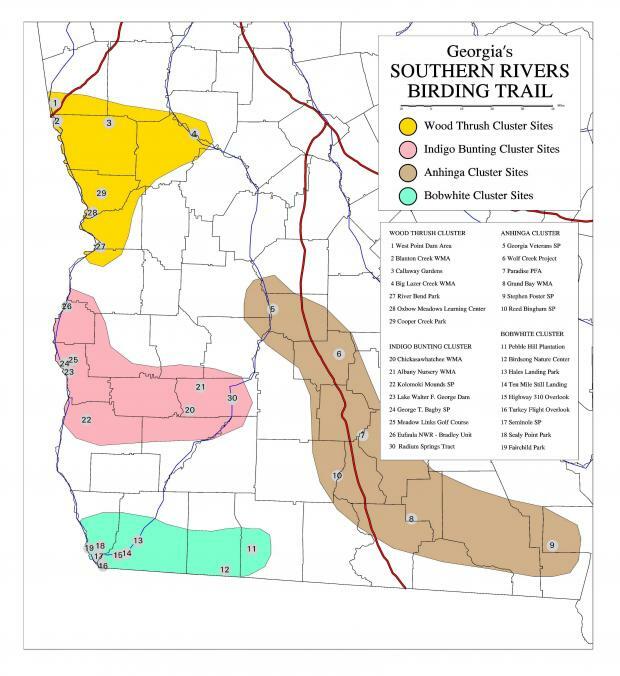 Southern Rivers Birding Trail maps and bird lists are available at local Visitor Centers or by calling 478-994-1438. For a full brochure, call 478-994-1438. This Youth CBC is specifically for kids. A visit to one or more sites along the Colonial Coast Birding Trail will provide you with the opportunity to see and enjoy the beauty of a kaleidoscope of birds and glimpse the fascinating history of this land and its residents. TALON is a one-of-a kind camp for teens with a strong interest in the outdoors, birding and ecology. View a stream of bird cams on Skidaway Island. These cameras focus on bald eagles nesting in a tall pine near the Cage Center on Berry College's 27,000-acre campus in northwest Georgia.